Included in the 1851 plans for Central Park was a Concert Grounds. Calvert Vaux and his talented assistant Jacob Wrey Mould designed a fairy-tale setting consisting of fountains, wooden benches, lacy cast iron birdcages and a wisteria-entwined pergola. Central to it all was Mould’s bandstand: an oriental, cast iron pagoda-style gazebo, unveiled in 1862. 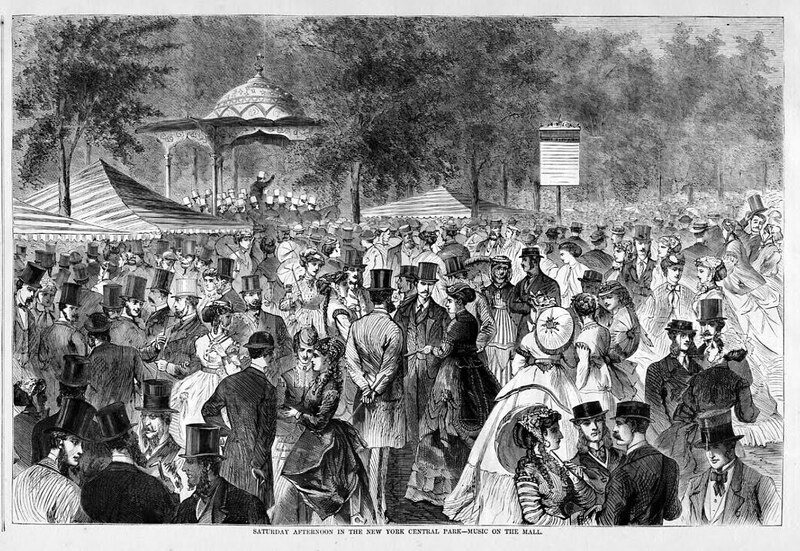 Vaux and partner Frederick Olmstead felt that “the effect of good music in the park is to aid the mind in freeing itself from the irritating effect of urban conditions.” To this end, no popular music was allowed to be performed that appealed to the baser of instincts. As the new century neared, the parks commissioners loosened up and choral and folk music were permitted and around the turn of the century John Philip Sousa performed his marches from here. 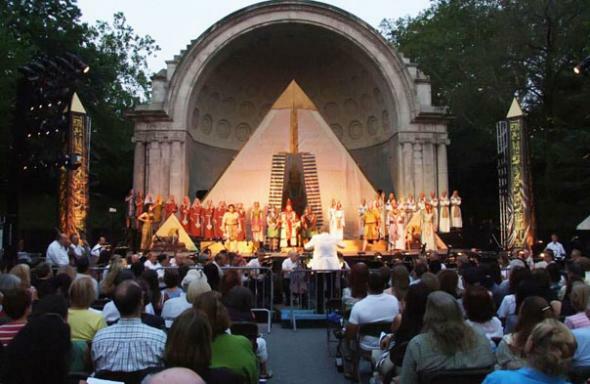 In 1905 German immigrant and banker, Elkan Naumburg, envisioned free symphonic concerts in the park. Beginning that year Naumburg, who founded the Oratorio Society of New York, began funding the concerts. 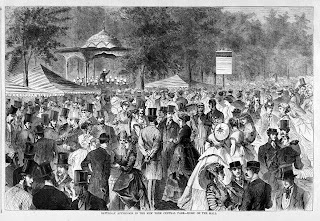 Hundreds of New Yorkers congregated in the Concert Grounds to hear waltzes, shortened operas, arias and portions of symphonies. They would often picnic on the grass and, as night fell and the gas lamps were lit, would waltz under the stars. In 1912 the beautiful old Concert Grounds were no longer adequate for the size of the crowds the concerts attracted. Naumburg offered to donate a new bandshell and called upon his nephew, architect William G. Tachau to design one. Mould’s unique cast iron pagoda was razed, the filigree birdcages were scrapped and the Concert Grounds paved over. Construction began on Tachau’s 1916 designs in 1921 and the bandshell was completed two years later, opening on September 29, 1923. 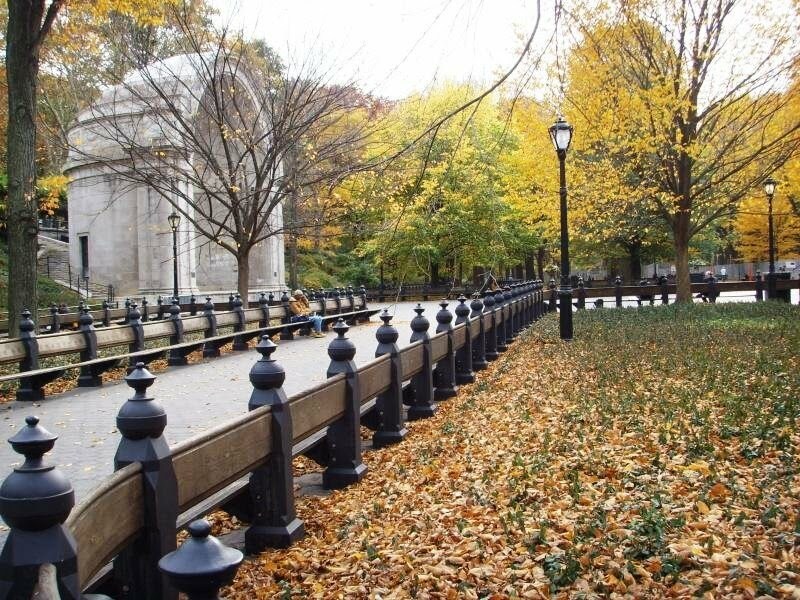 When Eklan Naumburg died the following year, his sons Walter and George took up the cause and continued funding the Central Park concerts. Both left provisions in their wills to endow the concerts going forward. From its stage the Reverend Dr. Martin Luther King Jr. spoke, as did Fidel Castro. And it was from here that John Lennon’s eulogy was given. By the end of the 1980s, however, trouble was brewing for the now-aging band shell. 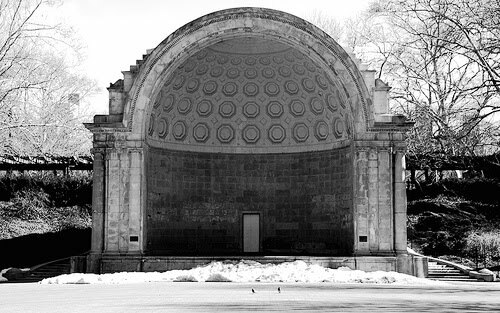 Despite heated protests by Elkan Naumburg’s family, preservation groups, and New Yorkers in general; the New York City Art Commission authorized demolition of the bandshell in January 1992. Naumburg’s great-grandson, Christopher London was crestfallen. “The band shell has played an important role in the history of free public concerts and it’s part of people’s lives. To rip it down denies and eradicates that history for a misguided esthetic concept of purity that anyone who lives in New York knows doesn’t exist,” he said. London, an architectural historian, led preservationists in a drawn-out court battle. Finally in July of 1993 the New York State Court of Appeals blocked the demolition citing a city law requiring protection of municipal gifts. Work "around it" they did. A $3 million restoration of the concert grounds was completed which did not include the band shell. It sat barely used and unmaintained for another ten years. The restoration costs that were estimated at $250,000 in 1993 had now climbed to as much as $2 million. With a new administration came changes. In 2003 restoration efforts began. Structural engineer Robert Silman was brought in to assess water damage and a possible shifting of the dome. With little money available from the city, fund raising efforts were initiated by the Central Park Conservancy and other preservation groups. Today Elkan Naumburg’s vision of free public concerts is up and running again. Among the concerts offered in his bandshell are fully-staged grand opera productions by the New York Grand Opera. The iconic bandshell has appeared in numerous motions pictures such as Hair, I'm Not Rappaport, Breakfast at Tiffanys and Mighty Aphrodite. Once referred to as Central Park’s “sore thumb” it is treasured by millions of New Yorkers.